if like me, you are lucky enough to have a man (or two) in your life who loves handknits, you also might, once in awhile, secretly rue the day you introduced him (or them) to handknits socks. especially when the holidays loom and socks are at the top of their wishlist(s). oh, the number of stitches needed to fit those big feet! but let’s face it—we’re pushovers at heart; we can’t say no. and flattery will get them everywhere . . .
it helps is to make sure there is something in it for us—plump, bouncy yarn that we look forward to knitting with, easy portability, and a stitch pattern that begs us to work “just one more row repeat”, before putting it down. 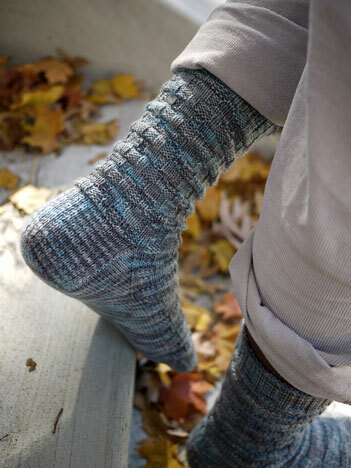 this sock is such a one—it practically knits itself, even in a big size. shown here, size large in tanis fiber arts purple label cashmere yarn, a delicious merino/cashmere/nylon sock blend, in colorway shadow. 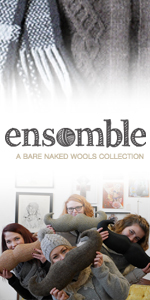 simply yummy to knit with; if you cave, you won’t be disappointed. thank you so much, tanis, for introducing me to your incredible cashmere sock yarn; i’m sure i’ll be knitting with it again—and soon, i hope. tanis fiber arts offers a range of yarns from stunning silk lace to cozy aran weight merino a wide array of gorgeous colors. you can browse her complete selection in the tanis fiber arts online shop, or look for one-of-a-kind skeins and sundries in her etsy shop. 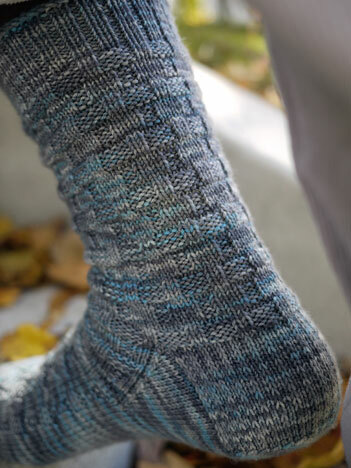 our enthusiastic test knitters for this project were agnes and gail, who actively campaigned for and encouraged the return of my sock mojo, which resulted in the formulation of this design. thanks you two! and many thanks to david, our sock model—he is very patient. Great feet, David! And wonderful socks, Anne! I LOVE it! Thanks so much for your kind words about my yarns, your sock design is perfect, I will definitely be knitting these for my dad this Christmas. Absolutely beautiful! So happy to see this pattern in my Google Reader today! You said it right on about the agony of knitting for our men. Tanis’s yarns are on my xmas list (I have gone a bit overboard between Rhinebeck, Stitches East and this past weekend’s New England Fiber Festival). Can’t wait to knit these! Another gorgeous design. Well done! I would make these for myself. I have been watching my husband but he loves his knee hi’s. so if I do make him a pair it needs to be alot longer in the leg! I can make the modifications but would need about a skein or so more than is called for. He is rough on socks so I am not too sure what yarn I would buy him. He is a sweetheart but not too sure he will wear them! On another note, I am knitting several of your patterns and have featured the progress on my blog! I love the cradle me and honey baby. Doing both in totally different yarns. Both, look great so far! This pattern will be a friday indulangance as I may get the recommended yarn! LOVE. THESE. 🙂 And I have some Tanis, too. Hmmm…. Thanks so much, Anne! And David, of course! Enjoy these! Another winner. I’m definitely making these for my son for Christmas. He loves your patterns. Manly socks is what he calls them. David makes a wonderful model for you : ) You two are a great pair. 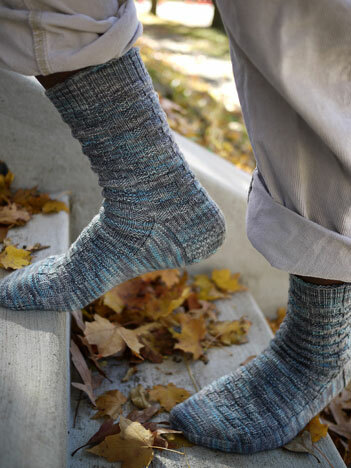 Wonderful sock modelling, great photography, and yummy looking yarn! These look great! and such wonderful modeling too. These are great! Thanks for another yarn to buy. I love making socks. You plug along, stitch by stitch and watch as the design begins to emerge. You think with each phase what a nice sock it is going to be and then you are done and started on the next and you get to play all over again. But NOTHING is quite as satisfaying as seeing the finish pair of them on the feet – as if they are brand new and you haven’t ever seen them before that moment! 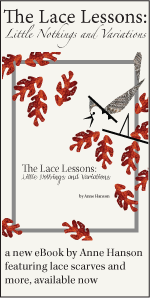 These are great Anne – such a simple and elegant design that has taken so well to the varigated colors in the yarn. I love patterns where you can use a pretty, pretty fiber, and still see both it and the design! I loved knitting these socks! Definitely a few more pairs are going to be part of my Holiday gifts. David is a wonderful model too! You and David are absolutely fabulous! Thanks Anne, as you know, I am always ready, able, willing, & happy to test knit socks for you. Oh I have been waiting for this from the moment I saw the first sock started. I ordered my own Shadow from Tanis. I wound my yarn cake yesterday to wait for the release of the pattern. I am so excited that I will probably go home and start my own socks tonight. Love, Love, Love this pattern. By the way, imitation is the sincerest form of flattery, right?? I think I’ve just found the perfect pattern for Mr JK’s Xmas socks! Thanks Anne. 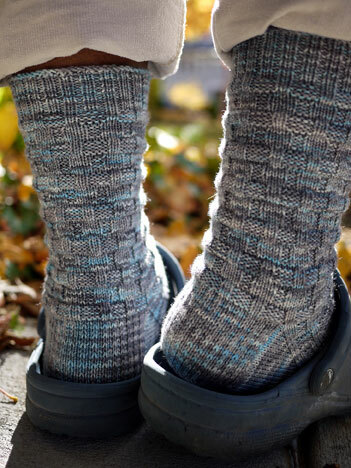 I loved these socks that you were working on in Rhinebeck! David is lucky to have such a beautiful pair of socks! May I make a little request? When you and David have done such a stellar job of photographing every angle of a garment, it’s a shame to let these posts just get washed away in the blog stream. Any chance you could link the pattern release blog post to the item listing in your pattern shop? While I was knitting Highlander (btw, Thanks! I get tons of compliments on it) I had to check the photo details a couple of times, and kept forgetting to bookmark the post once I hunted it down. I’ve also found when looking at the pattern shop I could sometimes use one more photo to decide whether to purchase a pattern. 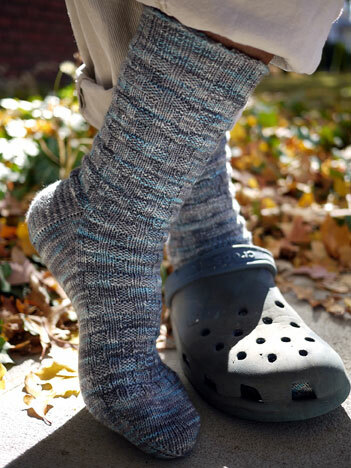 I’ve been putting off knitting my husband socks because his feet are enormous, but he might just get a pair of these. Great pattern! These are wonderful!!!!! 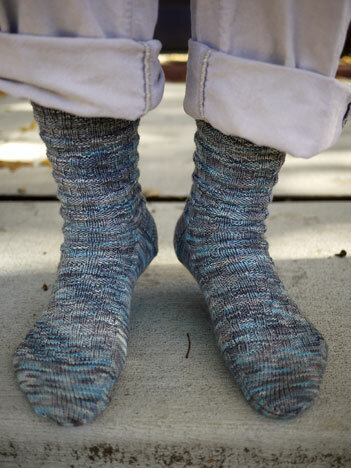 I MUST learn how to make socks and this pattern is just the one that will make me just do it. Thanks to both you and David. Oh Anne, they look great on David! I love that yarn. The color is just great. Gorgeous socks & David is a great model. I sometimes wish I did not introduce handknit socks to my husband as he expects a few pairs every winter.